A fanatic shot dead Punjab Minister for Social Welfare Zill-e-Huma Usman â€œfor not adopting the Muslim dress code” at a political meeting here at the PML House on Tuesday. A party worker caught the accused, Maulvi Sarwar, and handed him over to the Civil Lines Police. Huma was at the PML House to hold an open Kachehry. As she was busy meeting the PML women activists, the accused sitting in the audience approached her with a pistol and pumped bullets into her head from a point-blank range… The accused, M Sarwar Mughal – popularly known as Maulvi Sarwar – is a resident of Baghbnapura in Gujranwala. Two police stations of Gujranwala and the Tibbi police of Lahore had booked Maulvi Sarwar for the murder of six women, but he was acquitted for want of sufficient evidence. His alleged spree of killing â€œimmoral” women started in the year 2002. In his confession statement before the police on Tuesday, he said he was opposed to women holding public office. 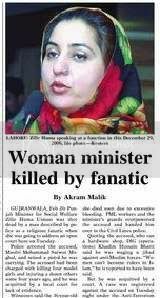 He added that after he read in the newspaper that the minister was holding an open court, he decided to kill her. Sometimes you just wonder why! Sometimes you just want to give up! I have been feeling sad and numb and down and dejected all day. 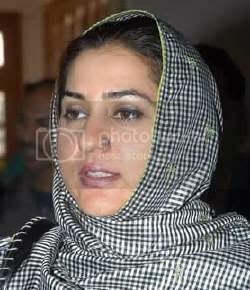 I heard about the brutal murder of Punjab Minister Zile Huma Usman’s murder by a crazed fanatic some 10 hours ago. And I have been in utter shock. I have tossed and turned. I had thought earlier that I would not even write about it. What is the use? When a society goes so mad that a woman is killed just because she is a woman, what can a blog post do. Just ignite more silly debates; more childish heckling; more immature point-scoring; trying to show how smart you are; or, more likely, trying to show how idiotic others are; reaffirming your own belief that you are always right, and everyone else is always wrong; single-track chest thumping; self-righteous finger-pointing. No remorse. No compassion; not a word of sympathy; not a shred of caring. All there is, is anger; getting high on our own anger; anger for its own sake; getting so very angry that you even forget what or who you are angry at. But now I do want to write about this. We, as a society, have some serious thinking to do. What killed Zille Huma Usman? Not religion. Not madness. But anger. Uncontrolled anger. A society that seems to be fueled by anger. No conversation is seen to be legitimate unless it is an angry conversation. And the solution to everything seems to be violence. ‘Kill the infidels’ say the believers. ‘Kill the mullahs’ shout the modernists. ‘Hang them by the gallows.’ ‘Put them in boats and let them sink.’ ‘Death is what they deserve.’ We have heard it all right here. I suspect we will hear it again. That dastardly, self-righteous anger. This violence in the language, as Zille Huma so tragically found, becomes the violence of bloodshed all too easily. Today it was in the name of religion. Tomorrow it will be something else. So, do me a favor folks. Give her some dignity. Hold your anger. Think about what happened. Ponder. And pause. For the sake of whatever is sacred to you; please pause! An innocent woman’s life has already been taken by our inability to put a lid on our passions and our anger. Let us please not make a tamasha out of her death by making her a poster child for whatever ’cause’ we are parading for right now. 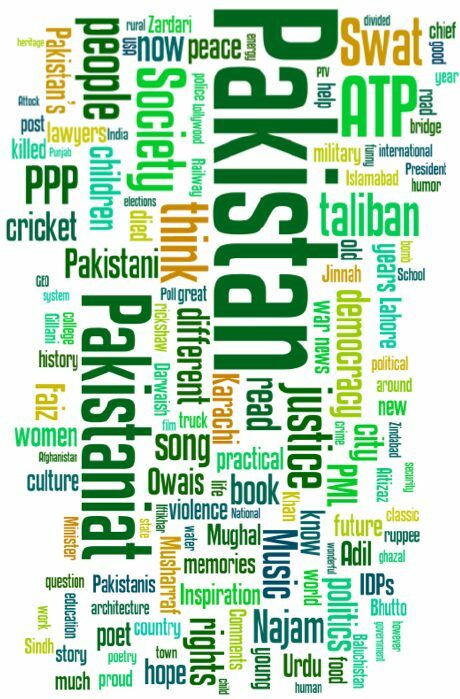 Religion should be banned in Pakistan….anyone talking about religion in politics should be hanged. By definition,he is not a mullah or any religious person but he killed her for his own reason. I oppose this dragging which is not done by non-muslims but other groups as well who say they are muslims and follower of a religion. King – you hit the spot. Just imagine what non Muslims think when they see something like this. We can sing and dance (or not!) about Islam being a tolerant religion but but but…till our so called learned and wise men (who have spent lives studtying the holy book) cannot muster up the cojones to stand up for what is islamically a no no, well, we are done for mate. And that partly explains where we are and why we are there. And most likely continue to stay there. As if Mullahs are only muslims and you and me have no responsibility to educate others? We shouldn’t seek any excuses because Quran was not revealed for Mullahs only or for muslims only, anyone could read it to find out what it actually says.